Can you believe it's December already? Are you guys all ready for Christmas? Well, not me... but working hard to get a head of game so I can enjoy it a bit more this year! I am super excited to share with you that I was asked to Guest Design for Sweet Stamps for the month of December! I am so honored to work with the other DT members and to be apart of their exciting challenges this month :) I will have a project to share each Monday in December so please be sure to stop back and check them out! 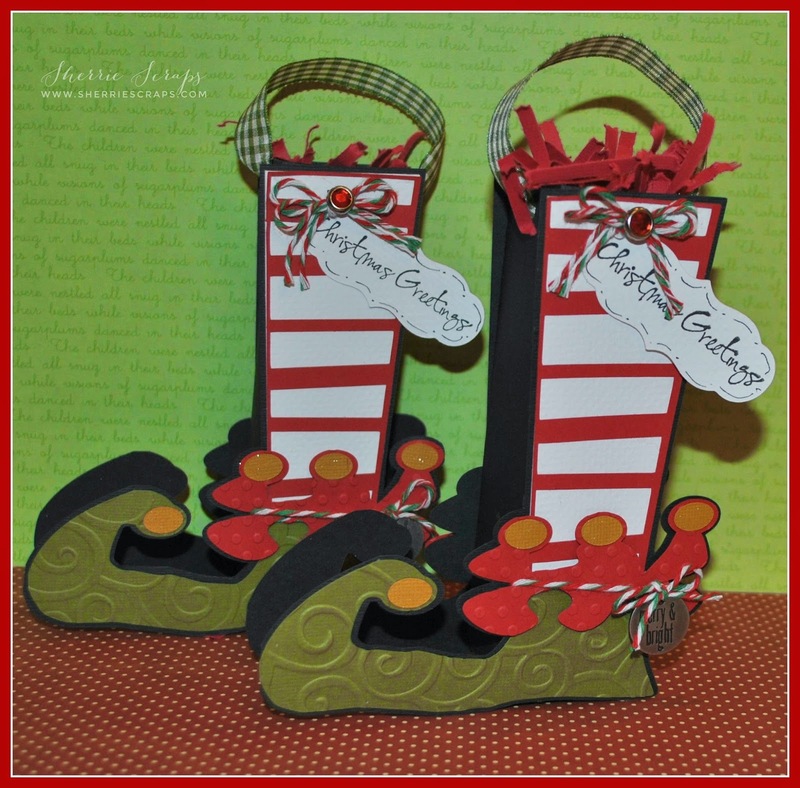 For my project, I made this darling elf stocking treat box~I found the cut file at the Silhouette Store, Design #52657. 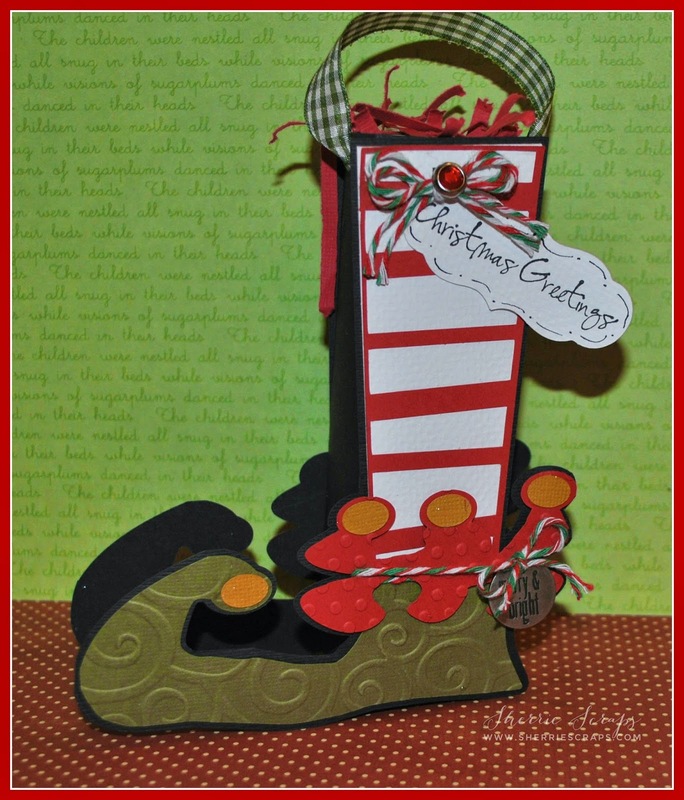 I used the divine swirls and swiss dots embossing folders to add some dimension to the shoes. I als added a little Wink of Stella to part of the shoes for a shimmery look. I wrapped some fun twine that I had from my stash and added a cute little charm that is from Tim Holtz. The tag is from the Art Philosophy cartridge and cut at 1". 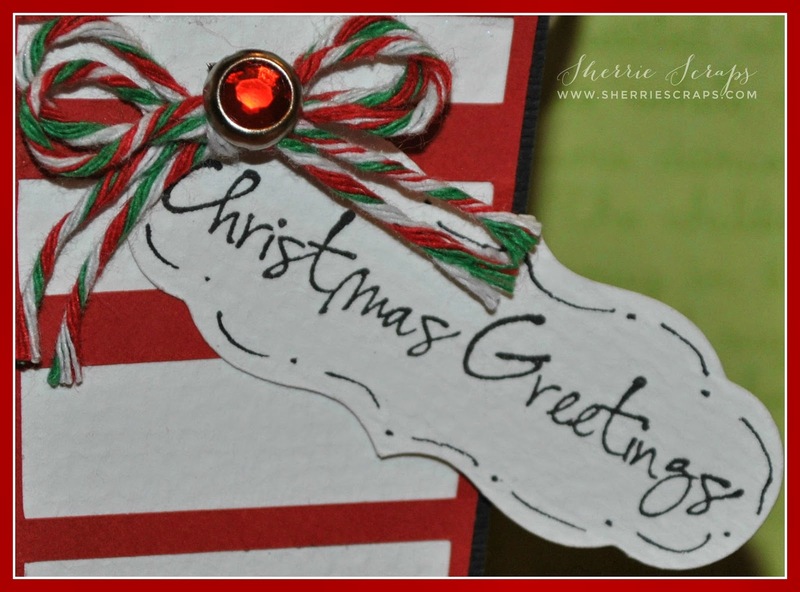 The sentiment is stamped with Sweet Stamps Christmas Greetings. I finished with tying a bow and adding a small embellishment to the center. So, what do you think? So, are you ready for Thanksgiving? We are just getting ready to go back home to spend Thanksgiving with family! I am so excited to see everyone! My sister and I are even gonna take in a little Black Friday shopping! That should be fun and a bit crazy to, ha? Before I go, I have a cute little card to share with you. 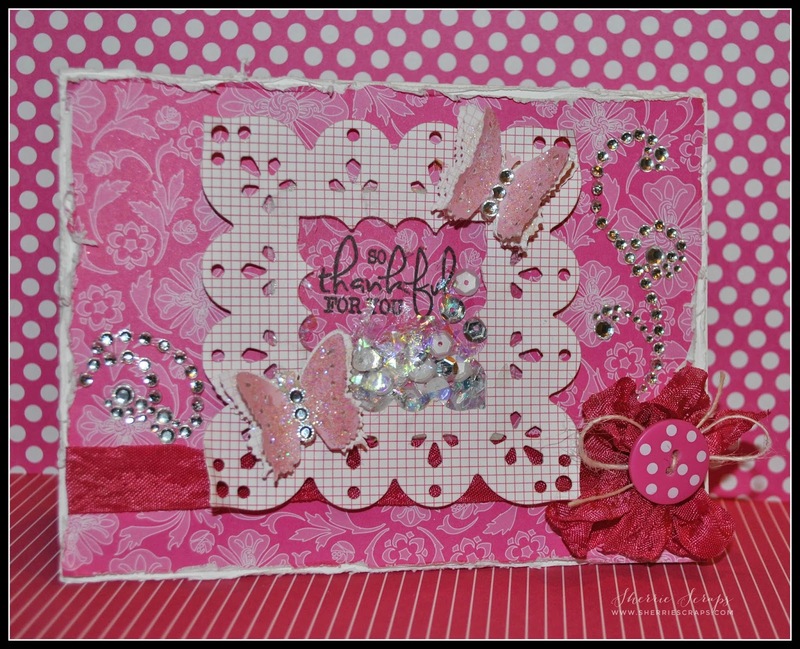 I used fun stamps from My Craft Spot and a darling cut file from Kadoodle Bug Designs. The card base and base layers are cut and then distressed using the Zutter DIA. I adhered them in place and then added a small panel at the bottom. I then stamped the sentiment with the Fall Leaves stamp set. I cut all the pieces for the bear, inked the edges with walnut stain and then put it together. 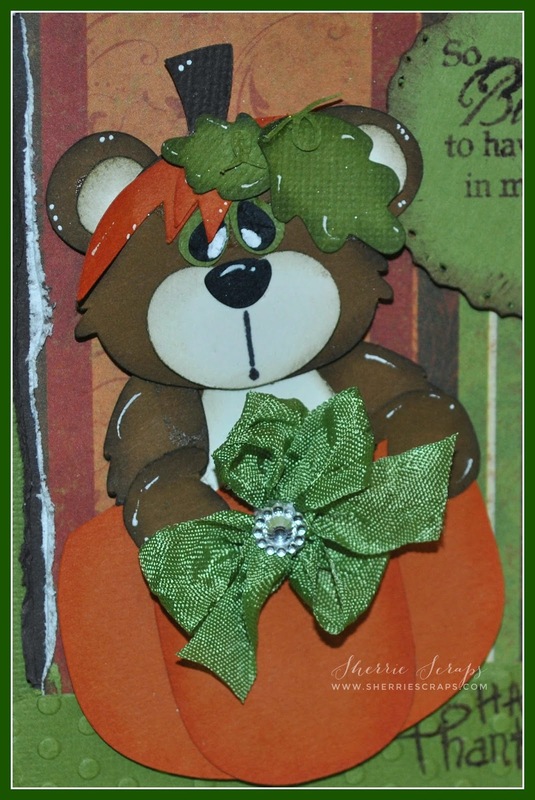 I added a little doodling, then a cute bow with toadally green crinkle ribbon and a small gem from my stash. The scalloped label is cut at 2" from the Artiste cartridge which I inked around the edges and then stamped the sentiment with the Happy Thanksgiving stamp set. Wishing you warm and heartfelt blessings this holiday season. I hope you had a wonderful weekend and are having a good start to a new week! I have been away for the last 4 days at a fun scrap retreat~I had such a wonderful time getting away and doing fun crafts, shopping and spending time with my friends! I think I did more talking, goofing around then actually crafting, hehe! I have a fun treat box to share with you today. Did you know that Kimberly at My Craft Spot has SVG files? This is a darling present box I picked up over at her store and it was super easy to cut out and I can't wait to make more. Be sure to pop over to the store and check out here amazing files! After cut out and assembled, I added a darling tag. 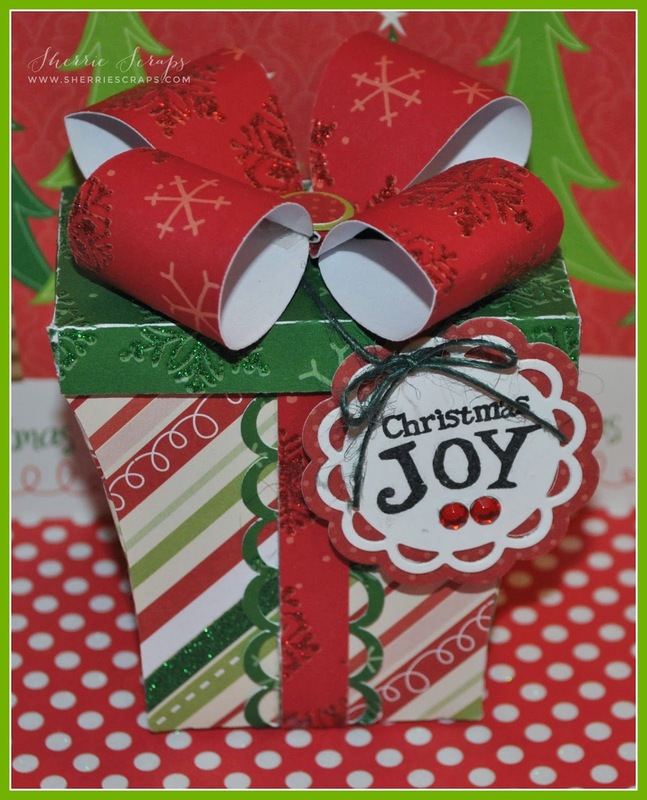 The tag was created with the coordinating Tiny Doilies metal die and I stamped the sentiment with the Merry & Bright stamp set. I tied the tag on with green Jute String and finished with a bow and a couple gems from my stash. Today is my little sweet pea's 3rd birthday...Wow, I can't believe she is 3 already! She is a blessing and I just love the time I get to spend with her:) We are also so excited that her little sister will be arriving in February....Grand baby #2 for us!! Today I also have a shaker card to share with you. I made this for a friend of mine whom I'm so thankful for and just don't tell her near enough. I started with a white card stock base. The base layer is another layer of white card stock that I distressed using my zutter DIA. I then followed with a layer of pretty pattern paper from Recollections, which I also distressed. I used the Spellbinders Fair Isle Pendant die for the beautiful frame. Inside the shaker, the sentiment is stamped with My Craft Spot's Thank You stamp set and sequins and mica flakes were added before I put in place. The butterflies are created with the EK Success layering butterfly punch and with foam dimensional adhered them down. I added some sparkling ice glitter and a few gems to the center of each butterfly. 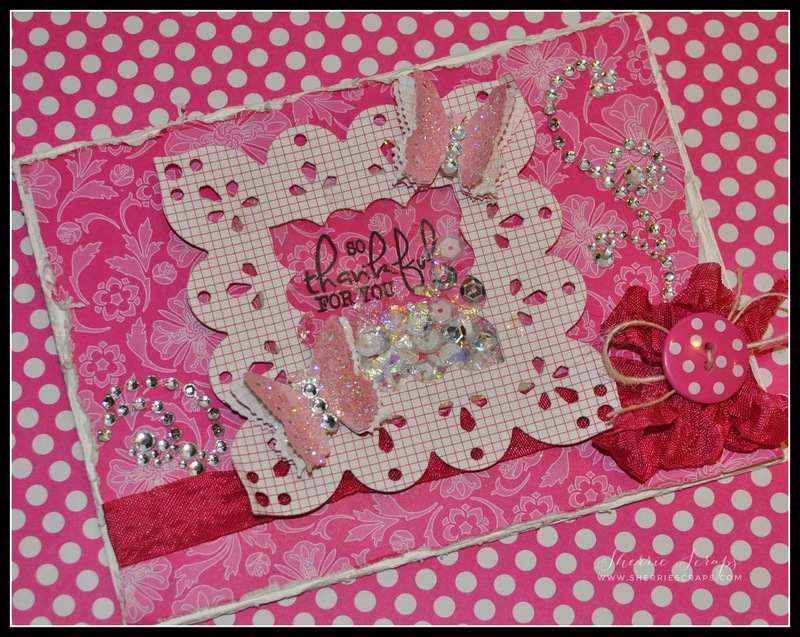 The gem flourishes are from Recollections and I finished with a double bow using ribbon from my stash, jute string and a pretty polka dot button. Hello and Welcome on Sherrie Scraps with Passion! I hope you are having a great week so far...mine is flying by! I have a fun little treat favor to share with you that I made for a baby shower last weekend my daughter and I helped put on. 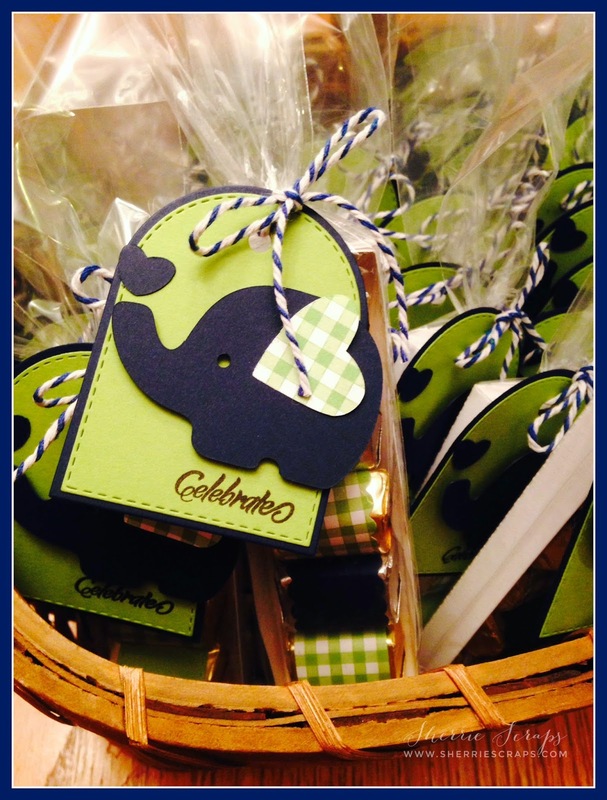 The theme of the party is elephants and thought this would be perfect for the guests... I made about 40 of these cuties! I found this cute little cut file at the Silhouette store a while ago and just waiting to use it. The elephant is cut at 1.54 x 2.29 and using pop dots, I adhered it to the tag. The tag is My Creative Time's Just Tags metal die and the sentiment is from Teeny Tag Greeting stamp set. 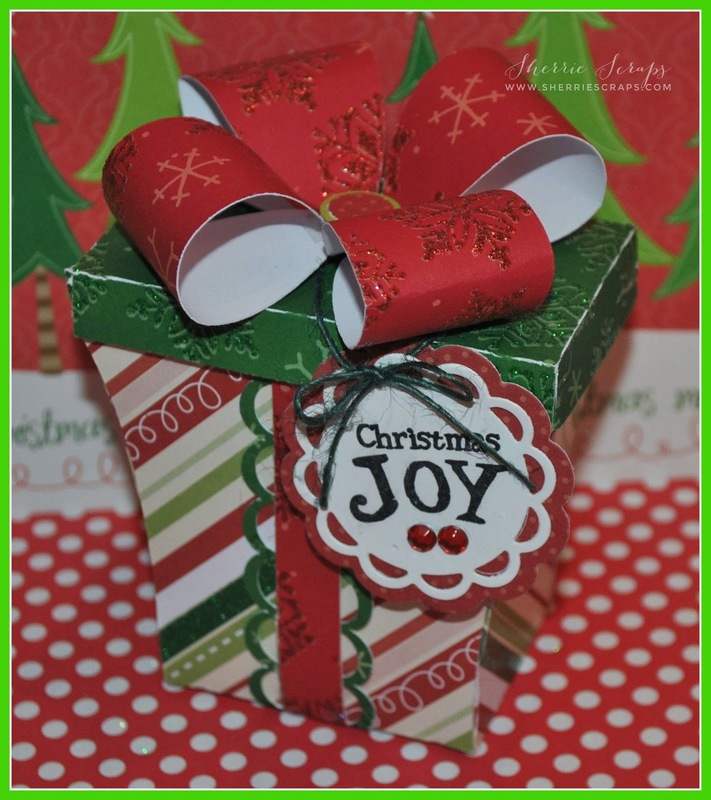 I used the Jaded Blossoms Candy Wrap die and wrapped the Hershey nuggets with papers from Bazzill and Recollections. The box is created using Jaded Blossoms Candy Caddy metal die which I placed the nuggets into and then slipped them into a pretzel bag. I finished with tying the tags on with some fun twine from my stash.